The IRF & RA Regional Conference for Asia and Australasia has proved to be the flagship event for the road sector in the region and promises to become a regular appointment. An IRF Africa Chapter has been established following deliberations of the IRF Road Safety Challenge for Africa held in Addis Ababa in March. 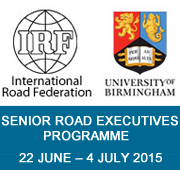 IRF has renewed and expanded the collaboration with the University of Birmingham. 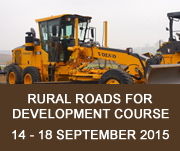 This collaboration covers in addition to the annual Senior Road Executives Course (22 June – 4 July), three new courses on: road safety, rural roads and road management. The IRF & CHTS 2015 China Congress will be held in Chongqing on 20-22 September. The call for abstracts is open till 21 June. The IRF World Road Statistics (WRS) continue to be the most comprehensive, universal source of statistical data on inland transport and road infrastructure. You will be able to read more about these achievements and on-going initiatives in this edition of the newsletter. We look forward to meeting or hearing from you soon again! Coinciding with the UN Global Road Safety Week, IRF and Roads Australia organized their first joint conference “IRF/RA Regional Conference for Asia and Australasia” on May 4-6 2015 in Sydney. Road safety was a key theme of the Conference, alongside innovation and value-for-money procurement and delivery of infrastructure. Early March, the IRF organized a premiere event in Africa, in Addis Ababa, Ethiopia. The “IRF Road Safety Challenge for Africa: Accomplishing Targets of Road Safety in Accordance with Decade of Action Plan” gathered more than ten Ministerial delegations from the region demonstrating their support and the urge to boost Road Safety efforts in the region. The International Road Federation (IRF Geneva), the Transport Planning and Research Institute of the Ministry of Transport of China (TPRI), and the China Highway and Transportation Society (CHTS) will be hosting a major conference in the beautiful city of Chongqing, China on 20-22 September 2015. The call for abstracts is now open. The 2015 General Assembly meeting took place in the margins of the IRF/RA Regional Conference for Asia and Australasia, on 3rd May. The meeting was the opportunity to review activities carried out and plan for the year to come. The IRF Board of Directors met also back to back with the GA to discuss strategic plans. IRF continues its work as Chair of the Pillar 2 “Safer Roads & Mobility” within the United Nations Road Safety Collaboration (UNRSC). The latter met in Geneva on 27 March to advance preparation of the Ministerial Meeting which will be hosted by Brazil next November. 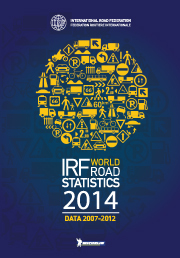 The International Road Federation (IRF) has been publishing the World Road Statistics (WRS) every year since 1964. The IRF WRS continue to be the only comprehensive, universal source of statistical data on inland transport and road infrastructure. 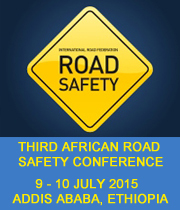 Strengthening national capacity in road safety management was the main objective of the Seminar held on 6-7 May 2015 in Algiers. Prof Sikdar from IRF India Chapter was among the experts invited to contribute to this important event for the country. 4th International Conference on Driver Distraction and Inattention announcement - Organized by ARRB - Early bird registration is now open! The 4th International Conference on Driver Distraction and Inattention (DDI2015) hosted by ARRB will be taking place in Sydney on November 9 – 11, 2015, outside Europe for the first time. The major themes for the conference this year will include distraction and the automated vehicle, and the relationship between research findings yielded in experimental versus real world studies. Following the request of an IRF members, we are currently looking for papers, research and documentation or even testimonials on how innovation in road construction can influence a project cost. 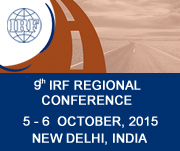 As a member of the IRF, you benefit from this platform to share news with other members. Please send information on your current activities and projects to membership@irfnet.ch and have it published in the next IRF Newsletter! Join the IRF today! Take advantage of a whole range of services including special rates for the IRF World Road Statistics (2014), other IRF publications and preferential registration rates for upcoming IRF events! 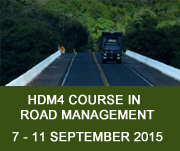 © Copyright International Road Federation 2015. All rights reserved.